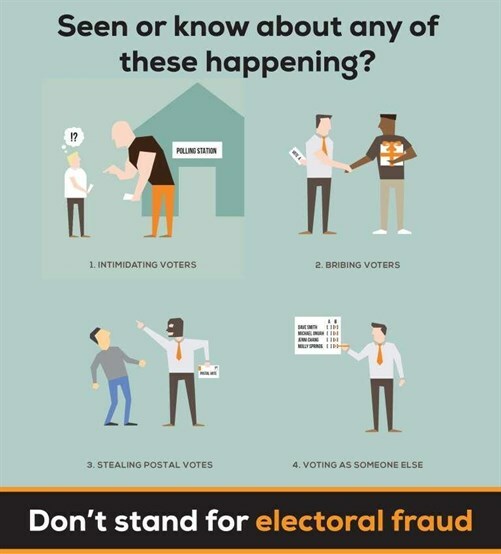 Independent charity Crimestoppers and the Electoral Commission are calling on the public to be aware of the threat of electoral fraud, as the UK prepares for a General Election on Thursday 8 June. The three-week campaign, which launched on the 1 June, highlights the tell-tale signs of electoral fraud. This includes intimidating or bribing voters, stealing postal or proxy votes, voting as someone else, tampering with ballot papers or postal ballot packs, or asking someone to reveal their marked ballot paper. Mark Hallas, CEO of charity Crimestoppers, said: “Electoral fraud damages the UK’s tradition of free and fair elections, which is respected across the world. Incidents of people trying to unduly or illegally influence or rig the outcome of a ballot – or simply not playing by the rules – undermines the public’s trust and is a crime, which is why our independent charity is here to take information on electoral fraud anonymously. Tampering with ballot papers or postal ballot packs. Crimestoppers and the Electoral Commission have been working together since 2015 when they joined forces to raise public awareness and encourage people to report their suspicions at the General Election. Tom Hawthorn, Head of Policy for the Electoral Commission, said: “It is important that when voters go to the polls on 8 June, they are confident the police and prosecuting authorities take allegations of electoral fraud seriously. Significant sentences will be imposed when electoral law is broken, and those responsible for electoral fraud can face jail. We are pleased to be working in partnership with Crimestoppers to raise public awareness of this. The campaign includes a schedule of posts on Facebook and Twitter designed to improve the public’s understanding of what constitutes electoral fraud and offer available options in terms of reporting any concerns. Returning Officers across the United Kingdom will also be provided with campaign posters to be positioned in polling station on the day of the election. Members of the public can also report to their local police by calling 101 or they can speak to their local council’s Returning Officer. For more information, visit crimestoppers-uk.org/electoral-fraud.